For the ESA space probe, see Philae (spacecraft). Philae (/ˈfaɪli/; Greek: Φιλαί, Arabic: فيله‎ Egyptian Arabic: [fiːlæ], Egyptian: p3-jw-rķ' or 'pA-jw-rq; Coptic: ⲡⲓⲗⲁⲕ, ⲡⲓⲗⲁⲕⲭ) is an island in the reservoir of the Aswan Low Dam, downstream of the Aswan Dam and Lake Nasser, Egypt. Philae was originally located near the expansive First Cataract of the Nile in Upper Egypt and was the site of an Egyptian temple complex. These rapids and the surrounding area have been variously flooded since the initial construction of the Aswan Low Dam in 1902. 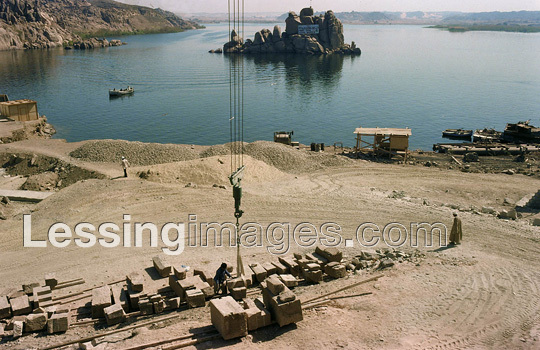 The temple complex was dismantled and moved to nearby Agilkia Island as part of the UNESCO Nubia Campaign project, protecting this and other complexes before the 1970 completion of the Aswan High Dam. The hieroglyphic reliefs of the temple complex are being studied and published by the Philae Temple Text Project of the Austrian Academy of Sciences, Vienna (Institute OREA). Philae is mentioned by numerous ancient writers, including Strabo, Diodorus Siculus, Ptolemy, Seneca, Pliny the Elder. It was, as the plural name indicates, the appellation of two small islands situated in latitude 24° north, just above the First Cataract near Aswan (Egyptian Swenet "Trade;" Ancient Greek: Συήνη). Groskurd computes the distance between these islands and Aswan at about 100 km (62 mi). Despite being the smaller island, Philae proper was, from the numerous and picturesque ruins formerly there, the more interesting of the two. Prior to the inundation, it was not more than 380 metres (1,250 ft) long and about 120 metres (390 ft) broad. It is composed of syenite: its sides are steep and on their summits a lofty wall was built encompassing the island. Since Philae was said to be one of the burying-places of Osiris, it was held in high reverence both by the Egyptians to the north and the Nubians (often referred to as "Ethiopians" in Greek) to the south. It was deemed profane for any but priests to dwell there and was accordingly sequestered and denominated "the Unapproachable" (Ancient Greek: ἄβατος). It was reported too that neither birds flew over it nor fish approached its shores. These indeed were the traditions of a remote period; since in the time of the Ptolemaic Kingdom, Philae was so much resorted to, partly by pilgrims to the tomb of Osiris, partly by persons on secular errands, that the priests petitioned Ptolemy VIII Physcon (170-117 BC) to prohibit public functionaries at least from coming there and living at their expense. In the nineteenth century, William John Bankes took the Philae obelisk on which this petition was engraved to England. When its Egyptian hieroglyphs were compared with those of the Rosetta Stone, it threw great light upon the Egyptian consonantal alphabet. The islands of Philae were not, however, merely sacerdotal abodes; they were the centres of commerce also between Meroë and Memphis. For the rapids of the cataracts were at most seasons impracticable, and the commodities exchanged between Egypt and Nubia were reciprocally landed and re-embarked at Syene and Philae. The neighbouring granite quarries also attracted a numerous population of miners and stonemasons; and, for the convenience of this traffic, a gallery or road was formed in the rocks along the east bank of the Nile, portions of which are still extant. Philae also was remarkable for the singular effects of light and shade resulting from its position near the Tropic of Cancer. As the sun approached its northern limit the shadows from the projecting cornices and moldings of the temples sink lower and lower down the plain surfaces of the walls, until, the sun having reached its highest altitude, the vertical walls are overspread with dark shadows, forming a striking contrast with the fierce light which illuminates all surrounding objects. The most conspicuous feature of both islands was their architectural wealth. Monuments of various eras, extending from the Pharaohs to the Caesars, occupy nearly their whole area. The principal structures, however, lay at the south end of the smaller island. The most ancient was a temple for Isis, built in the reign of Nectanebo I during 380-362 BC, which was approached from the river through a double colonnade. Nekhtnebef was his ancient Egyptian royal titulary and he became the founding pharaoh of the Thirtieth and last native dynasty when he deposed and killed Nepherites II. For the most part, the other ruins date from the Ptolemaic Kingdom, more especially with the reigns of Ptolemy II Philadelphus, Ptolemy V Epiphanes, and Ptolemy VI Philometor (282-145 BC), with many traces of Roman work in Philae dedicated to Ammon-Osiris. In front of the propyla were two colossal lions in granite, behind which stood a pair of obelisks, each 13 metres (43 ft) high. The propyla were pyramidal in form and colossal in dimensions. One stood between the dromos and pronaos, another between the pronaos and the portico, while a smaller one led into the sekos or adyton. At each corner of the adytum stood a monolithic shrine, the cage of a sacred hawk. Of these shrines one is now in the Louvre, the other in the Museum at Florence. Beyond the entrance into the principal court are small temples, one of which, dedicated to Isis, Hathor, and a wide range of deities related to midwifery, is covered with sculptures representing the birth of Ptolemy Philometor, under the figure of the god Horus. The story of Osiris is everywhere represented on the walls of this temple, and two of its inner chambers are particularly rich in symbolic imagery. Upon the two great propyla are Greek inscriptions intersected and partially destroyed by Egyptian figures cut across them. The monuments in both islands indeed attested, beyond any others in the Nile valley, the survival of pure Egyptian art centuries after the last of the Pharaohs had ceased to reign. Great pains have been taken to mutilate the sculptures of this temple. The work of demolition is attributable, in the first instance, to the zeal of the early Christians, and afterward, to the policy of the Iconoclasts, who curried favour for themselves with the Byzantine court by the destruction of heathen images as well as Christian ones. It's notable that images/icons of Horus are often less mutilated than the other carvings. In some wall scenes, every figure and hieroglyphic text except that of Horus and his winged solar-disk representation have been meticulously scratched out by early Christians. This is presumably because the early Christians had some degree of respect for Horus or the legend of Horus - it may be because they saw parallels between the stories of Jesus and Horus (see Jesus in comparative mythology#Ancient Egypt). The soil of Philae had been prepared carefully for the reception of its buildings–being leveled where it was uneven, and supported by masonry where it was crumbling or insecure. For example, the western wall of the Great Temple, and the corresponding wall of the dromos, were supported by very strong foundations, built below the pre-inundation level of the water, and rested on the granite which in this region forms the bed of the Nile. Here and there steps were hewn out from the wall to facilitate the communication between the temple and the river. At the southern extremity of the dromos of the Great Temple was a smaller temple, apparently dedicated to Hathor; at least the few columns that remained of it are surmounted with the head of that goddess. Its portico consisted of twelve columns, four in front and three deep. Their capitals represented various forms and combinations of the palm branch, the doum palm branch, and the lotus flower. These, as well as the sculptures on the columns, the ceilings, and the walls were painted with the most vivid colors, which, owing to the dryness of the climate, have lost little of their original brilliance. The ancient Egyptian name of the smaller island meant "boundary". 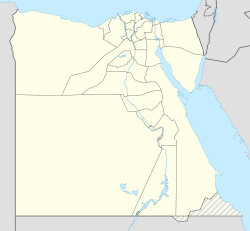 As their southern frontier, the pharaohs of Egypt kept there a strong garrison, and it was also a barracks for Greek and Roman soldiers in their turn. The first temple structure, which was built by native pharaohs of the 30th dynasty, was the one for Hathor. The island temple was built during the Ptolemaic Kingdom. The principal deity of the temple complex was Isis, but other temples and shrines were dedicated to other deities such as Hathor. Egyptologists believe that Philae was the last active site of the native ancient Egyptian religion, and that the last Egyptian hieroglyph was written there in the late fourth century. The temple was closed down officially in AD 537 by the local commander Narses the Persarmenian in accordance with an order of Byzantine emperor Justinian I. It then became a church of Saint Stephen. Ruins of a church have been discovered and more than one adyton bore traces of having been made to serve at different eras the purposes of a chapel of Osiris and of Jesus. The island of Philae attracted much attention in the 19th century. In the 1820s, Joseph Bonomi the Younger, a British Egyptologist and museum curator visited the island. So did Amelia Edwards, a British novelist in 1873–1874. The approach by water is quite the most beautiful. Seen from the level of a small boat, the island, with its palms, its colonnades, its pylons, seems to rise out of the river like a mirage. Piled rocks frame it on either side, and the purple mountains close up the distance. As the boat glides nearer between glistening boulders, those sculptured towers rise higher and even higher against the sky. They show no sign of ruin or age. All looks solid, stately, perfect. One forgets for the moment that anything is changed. If a sound of antique chanting were to be borne along the quiet air–if a procession of white-robed priests bearing aloft the veiled ark of the God, were to come sweeping round between the palms and pylons–we should not think it strange. —  Amelia B. Edwards, A thousand miles up the Nile / by Amelia B. Edwards, 1831-1892, p. 207. These visits are only a small sample of the great interest that Victorian-era Britain had for Egypt. Soon, tourism to Philae became common. In 1902, the Aswan Low Dam was completed on the Nile River by the British. This threatened many ancient landmarks, including the temple complex of Philae, with being submerged. The height of the dam was raised twice, from 1907–1912 and from 1929–1934, and the island of Philae was nearly always flooded. In fact, the only times that the complex was not underwater was when the dam's sluices were open from July to October. It was proposed that the temples be relocated, piece by piece, to nearby islands, such as Bigeh or Elephantine. However, the temples' foundations and other architectural supporting structures were strengthened instead. Although the buildings were physically secure, the island's attractive vegetation and the colors of the temples' reliefs were washed away. Also, the bricks of the Philae temples soon became encrusted with silt and other debris carried by the Nile. The temples had been practically intact since the ancient days, but with each inundation the situation worsened and in the 1960s the island was submerged up to a third of the buildings all year round. In 1960 UNESCO started a project to try to save the buildings on the island from the destructive effect of the ever-increasing waters of the Nile. First, building three dams and creating a separate lake with lower water levels was considered. First of all, a large coffer dam was built, constructed of two rows of steel plates between which a 1 million cubic metres (35 million cubic feet) of sand was tipped. Any water that seeped through was pumped away. Next the monuments were cleaned and measured, by using photogrammetry, a method that enables the exact reconstruction of the original size of the building blocks that were used by the ancients. Then every building was dismantled into about 40,000 units, and then transported to the nearby Island of Agilkia, situated on higher ground some 500 metres (1,600 ft) away. Prior to the inundation, a little west of Philae lay a larger island, anciently called Snem or Senmut, but now Bigeh. It is very steep, and from its most elevated peak affords a fine view of the Nile, from its smooth surface south of the islands to its plunge over the shelves of rock that form the First Cataract. Philae, Bigeh and another lesser island divided the river into four principal streams, and north of them it took a rapid turn to the west and then to the north, where the cataract begins. Bigeh, like Philae, was a holy island; its ruins and rocks are inscribed with the names and titles of Amenhotep III, Ramesses II, Psamtik II, Apries, and Amasis II, together with memorials of the later Macedonian and Roman rulers of Egypt. Its principal ruins consisted of the propylon and two columns of a temple, which was apparently of small dimensions, but of elegant proportions. Near them were the fragments of two colossal granite statues and also an excellent piece of masonry of much later date, having the aspect of an arch belonging to a church or mosque. Map of Philae with floor plan of the Temple of Isis. Temple hieroglyphs on stone at Philae. ^ Holger, Kockelmann, (2012-04-24). "Philae". UCLA Encyclopedia of Egyptology. 1 (1). ^ The Rescue of Nubian Monuments and Sites, UNESCO project site about Nubia Campaign. ^ Plutarch (1889). "De Iside et Osiride 359b". In Bernardakis, Gregorius N. (ed.). Moralia. 2. Leipzig: Teubner. Diodorus (1888). "I.22.6". In Bekker, Immanuel; Dindorf, Ludwig; Vogel, Friedrich (eds.). Bibliotheca Historica. 1–2. Leipzig: In aedibus B. G. Teubneri. ^ ἄβατος. Liddell, Henry George; Scott, Robert; A Greek–English Lexicon at the Perseus Project. ^ Senec. Quaest. Nat. iv. 2. ^ Ritter, Erdkunde, vol. i. p. 680, seq. ^ Joann Fletcher (2016). The amazing history of Egypt (MP3) (podcast). BBC History Magazine. Event occurs at 53:46. Retrieved 17 Jan 2016. ^ Aldred, Cyril (1998) . Dodson, Aidan (ed.). The Egyptians (3rd Revised ed.). London, UK: Thames & Hudson. p. 14. ISBN 9780500280362. ^ Foertmeyer, Victoria Ann (1989). Tourism in Graeco-Roman Egypt (PhD). Princeton University. p. 34. ^ "Report on the safeguarding of the Philae monuments" (PDF). November 1960. Retrieved 2014-10-25. This article incorporates text from a publication now in the public domain: Smith, William, ed. (1854–1857). "Philae" . Dictionary of Greek and Roman Geography. London: John Murray. Arnold, Dieter (1999). Temples of the Last Pharaohs. Oxford University Press. ISBN 978-0-19-512633-4. Cruz-Uribe, Eugene (2002). "The Death of Demotic at Philae, a Study in Pilgrimage and Politics". In Bács, Tamás (ed.). A Tribute to Excellence: Studies offered in honor of Erno Gaal, Ulrich Luft, and Laszlo Torok. Chaire d'Egyptologie de l'Université Eotvos Lorand. ISBN 978-963-463-606-9. Cruz-Uribe, Eugene (2010). "The Death of Demotic Redux: Pilgrimage, Nubia, and the Preservation of Egyptian Culture". In Knuf, Hermann; Leitz, Christian; von Recklinghausen, Daniel (eds.). Honi soit qui mal y pense: Studien zum pharaonischen, griechisch-römischen und spätantiken Ägypten zu Ehren von Heinz-Josef Thissen. Peeters. ISBN 978-90-429-2323-2. Dijkstra, Jitse H. F. (2008). Philae and the End of Ancient Egyptian Religion. Peeters. ISBN 978-90-429-2031-6. Haeny, Gerhard (1985). "A Short Architectural History of Philae". Bulletin de l'Institut français d'archéologie orientale. 85. Vassilika, Eleni (1989). Ptolemaic Philae. Peeters. ISBN 978-90-6831-200-3. Winter, Erich (1974). "Philae". Textes et langages de l'Égypte pharaonique: cent cinquante années de recherches, 1822–1972. Hommage à Jean-François Champollion. Institut français d'archéologie orientale. Wikimedia Commons has media related to Philae. Wikimedia Commons has media related to Temple of Isis in Philae and Trajan's Kiosk (Philae). Wikisource has the text of the 1905 New International Encyclopedia article Philæ.